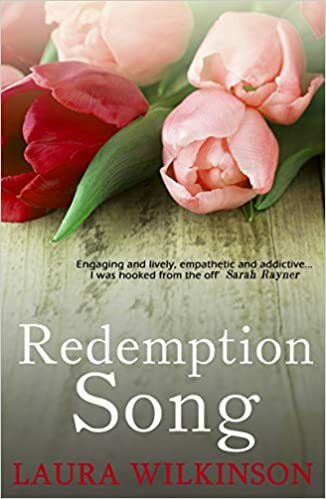 When Redemption Song was published earlier this year, I read lots of reviews from fellow bloggers and knew it sounded like my kind of book. I put it on my wish list to get around to reading sometime. I was surprised and delighted soon after when the author, Laura Wilkinson, got in touch to ask if I’d be interested in reviewing it. And what a wonderful book it is. Redemption Song tells the story of Saffron and Joe. The book begins with a dramatic prologue which sees Saffron in a terrible car crash, then the narrative moves to two years later. Although Saffron has survived the crash, the other occupants of the car did not and Saffron is struggling to cope with this. She has moved to the Welsh seaside town of Coed Mawr with her mother Rain, a minister at the baptist chapel, and together they are trying to come to terms with their losses and rebuild their lives. Saffron does not share her mother’s faith, a faith which Rain feels could offer her some comfort. When she meets Joe, a carpenter working on the chapel roof, they are drawn together. But Joe is also trying to put the past behind him, a past which he is keeping well hidden. I felt involved with these characters right from the beginning of the book. My heart went out to Saffron as she tried to deal with the guilt and anger she felt over the accident. She really had no reason to feel guilty but people’s reactions after a tragedy can defy logic. I could understand that she felt other people didn’t fully appreciate her feelings as there was an angle to the story that she didn’t share for a long time. There is a strong sense of community in this novel whether it’s the community of Coed Mawr or the Church community. It is refreshing to see a faith community portrayed in a positive light for a change. Rain’s faith is central to her life and she cares deeply about the needs and concerns of all the members of her community, whether Church goers or not. Joe was clearly a troubled soul. I was really puzzled as to what his background could be. Why had he fled what seemed to have been quite a privileged life and what was so bad that he had hidden himself away in this small town. He doesn’t want to get involved with Saffron but the attraction between the two was very strong. I so wanted them to be the ones to help heal each other but with so much guilt and secrecy, could this even be possible? They both needed to be able to let go of and be truthful about their pasts to move forward in any way. Redemption Song was a book I was totally engrossed in, very compelling. Laura Wilkinson has written convincingly and movingly about the swirl of complex emotions felt by her characters, which will have you feeling that you really know them. You will be turning the pages, keen to see if all turns out as you would hope. I think that it is true that most characters come to realise that in many ways, as Eifion says to Rain, “you are stronger than you think”. A beautifully told story of loss and the healing power of love and forgiveness. If you lost everything in one night, what would you do? Saffron is studying for a promising career in medicine until a horrific accident changes her life for ever. Needing to escape London, she moves to a small coastal town to live with her mother. Saffron hates the small town existence and feels trapped until she meets Joe, another outsider. Despite initial misgivings, they grow closer to each other as they realise they have a lot in common. Like Saffron, Joe has a complicated past … one that’s creeping up on his present. Can Joe escape his demons for long enough to live a normal life – and can Saffron reveal the truth about what really happened on that fateful night? Love is the one thing they need most, but will they – can they – risk it? Redemption Song is a captivating, insightful look at what happens when everything goes wrong – and the process of putting the pieces back together again.